While designers possess the creative capabilities of shaping cities, their often-singular obsession with form and aesthetics actually reduces their effectiveness as they are at the mercy of more powerful generators of urban form. In response to this paradox, Designing Urban Transformation addresses the incredible potential of urban practice to radically change cities for the better. The book focuses on a powerful question, "What can urbanism be?" by arguing that the most significant transformations occur by fundamentally rethinking concepts, practices, and outcomes. 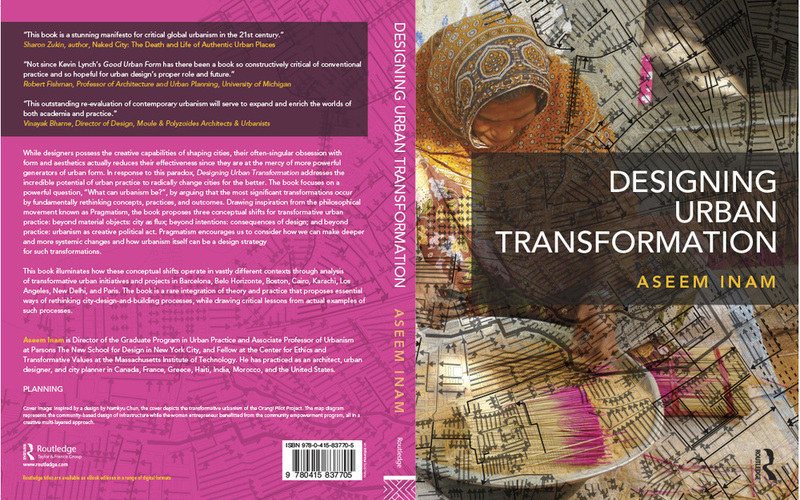 Drawing inspiration from the philosophical movement known as Pragmatism, the book proposes three conceptual shifts for transformative urban practice: (a) beyond material objects: city as flux, (b) beyond intentions: consequences of design, and (c) beyond practice: urbanism as creative political act. Pragmatism encourages us to consider how we can make deeper and more systemic changes and how urbanism itself can be a design strategy for such transformations. The book’s ten case studies of urban interventions from Barcelona, Belo Horizonte, Boston, Cairo, Karachi, Los Angeles, New Delhi, and Paris demonstrate the different ways and widely varying contexts in which this new approach can work—all with extremely impressive results.. The book is a rare integration of theory and practice that proposes essential ways of rethinking city-design-and-building processes, while drawing critical lessons from actual examples of such processes. In this thoughtful, hopeful and truly illuminating book, Aseem Inam combines a profound critique of urban design theory with a thorough examination of an impressively global range of projects from Barcelona’s Olympic Village to Al-Azhar Park in Cairo, from the favelas of Brazil to the villages of India, from the Pompidou Center to Boston’s Big Dig. Inam draws on his own extensive design experience and an original reading of Pragmatic philosophy to re-orient urban design toward social and economic empowerment. Not since Kevin Lynch’s Good City Form has there been a book so constructively critical of conventional practice and so hopeful for urban design’s proper role and future. Robert Fishman, Professor of Architecture and Urban Planning, University of Michigan. Aseem Inam has written a wise and thoughtful challenge to those who believe in static models of the city, and the developers, politicians and professionals who hold power over its material form. Insisting on the priority of the public realm, Inam presents urban design as a broad moral vision rather than a set of narrow, technical choices. This book is a stunning manifesto for critical global urbanism in the 21st century. Inam’s excellent treatise vests urban design in its larger socio-political context, using the lenses of pragmatism to understand its transformative potential. Instead of looking into the past, the author is more interested in exploring how urbanism can be a positive force in the ever-changing context of the contemporary and future 21st century city. Solidly grounded in theory, Inam expertly makes his message tangible by presenting a series of design initiatives or “case studies” from different parts of the world. This is a thought-provoking contribution to the field of urbanism! Anastasia Loukaitou-Sideris, Professor of Urban Design, University of California at Los Angeles. Though many claim to do so, few books actually succeed in capturing the symbiosis of urban theory and praxis as convincingly as this. Rich, erudite, practical and robust, it compels us to reconsider our very relationship with cities – whether as inhabitants, decision-makers or consumers. It reminds us that the art of urbanism is a constant negotiation between personal biases and socio-political realities, and that cities are evolving repositories of complex decisions, whims and choices, all in constant flux. This outstanding re-evaluation of contemporary urbanism will serve to expand and enrich the worlds of both academia and practice. Vinayak Bharne, Director of Design, Moule & Polyzoides Architects & Urbanists. Drawing on examples ranging in size from a museum to an Olympic village, and from around the world, Aseem Inam demonstrates how urban design can be transformative by being more inclusive and more political, and by abandoning its traditional commitment to a city fixed in time in an ostensibly ideal state. Simultaneously critical and practical, Inam has made a bold statement. Robert Beauregard, Professor of Urban Planning, Columbia University in the City of New York.